Involvement with the Royal Navy began with the Fleet Air Arm, commentating and advising on the Royal Naval Air Service’s Diamond Jubilee displays in 1974. Air Days and more followed but in 1988 came a unique challenge: “If you had six Sea Harriers; four Sea Kings; two Lynx; four Gazelles and twelve minutes, what would you do with them?” Roger Hoefling’s immediate reply was “Give me fifteen minutes and I can do something. Why?” The answer was that the Fleet Air Arm wanted a sequence comprising each of its principal aircraft variants for that year’s Society of British Aerospace Companies (SBAC) Display at Farnborough. It was to be the first time that the Soviet MiG-29 had visited a NATO country. Roger took 90 minutes to design the sequence, forecasting it would take 14 minutes and 30 seconds to fly. It took 14 minutes. With aircraft drawn from seven squadrons and four Royal Naval Air Stations, rehearsals could not take place until after arriving at Farnborough five days prior to the then seven-day event. Curtailed by weather, only four rehearsals were possible. For views on the results on which Roger also commentated, see MEDIA COVERAGE: ‘Flight Daily’ 8.9.1988 and ‘Aircraft Illustrated’ 5.1996. In 2004, Roger Hoefling undertook the task of making more effective Navy Days, the Service’s largest periodic public event. Thus, Roger introduced increased action in designing a two-hour display comprising eighteen Fleet Air Arm fixed- and rotary-winged aircraft; a frigate; assault ship; mine countermeasures vessel; landing craft and hovercraft, all in support of some two hundred Royal Marines in a simulated assault on HM Naval Base Devonport. This is the largest naval base in Western Europe and a nuclear establishment, the site of the UK’s submarine refuelling facility. Other new features like the admission pricing structure, online ticket sales, website, RSL radio and marketing, together with a travel network offering visitors free park and ride, ‘bus and ferry services as well as special ticket discounts across the national rail network, helped to improve by more than 30% on the previous Navy Days’ attendance. In turn, 23,700, 52% of the visitor total, used the travel network, equating to 47,400 passengers being carried. 2009 and the ‘Fly Navy 100’ programme of events marked the centenary of Royal Navy aviation for which Roger Hoefling was commentator and adviser. 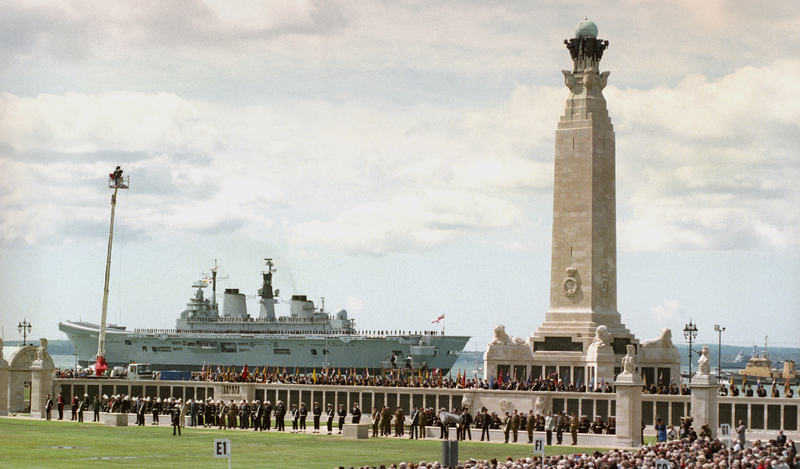 The public highlights comprised a ceremony and flypast at the Pioneer Memorial at Eastchurch on the Isle of Sheppey, site of the first Royal Naval Air Station, while at Greenwich and Liverpool, HMS Illustrious was the focal point for a 40-aircraft formation flypast; river and air displays and a Royal Navy exhibition. With 59 being Air Days, Roger Hoefling has been involved in 82 Royal Navy events and these have taken place at RNAS Culdrose, Lee-on-Solent, Portland and Yeovilton; HMNB Devonport, Rosyth and Portsmouth, as well as onboard HMS Ark Royal – see INTRODUCTION – Gloucester and Illustrious.